… and no, there’s nothing wrong with the Earth’s gravitational pull. Nostalgia has been “in” for a long while now, and it’s no news that games, especially the indie kind, have been shamelessly dipping their toes into it. Be it old movies, books, or even games themselves, the subject of recalling the rose-colored memories of yesteryear is a popular recurring theme. Why? Because everyone’s nostalgic about something. 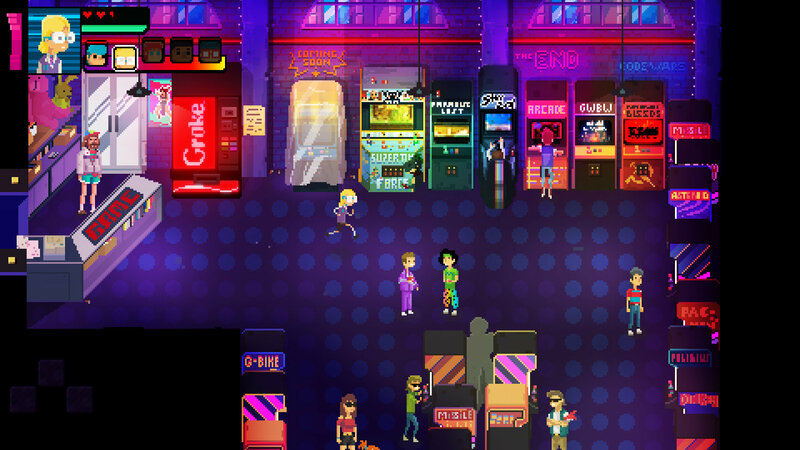 In Crossing Souls’ case, its aim is laser pointed to the 1980s and its pop culture. And while some might turn away from it due to its over-reliance to an extreme of tropes from that particular point in time, such as its dirty VHS tracking layered animated cutscenes or the drawn out, unskippable sequences full of awkward, long-winded dialog, there’s still plenty of charm to it. Picking up at some point in 1986, you play as a group of kids from a town in California who see themselves neck deep in a conspiracy that involves a certain magical artifact one of them happened to run into after a mysterious thunderstorm the night before. It all plays out like a mix between a whole bunch of movies from that time period, i.e The Goonies and Stand By Me — they even go as far as say something like “we’re doing this together!” every so often, just so you don’t forget the overt references — but at one point eventually takes a welcome, even if not particularly surprising turn. 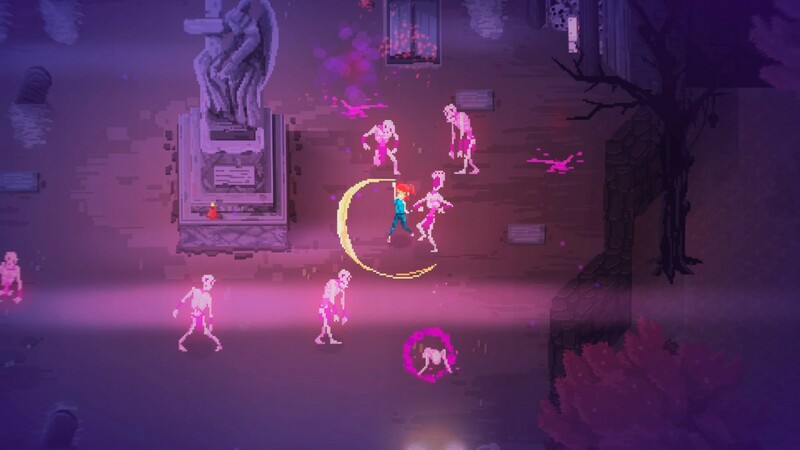 Clad in pixel art and using a viewpoint similar to something like Hyper Light Drifter, Crossing Souls has you take control of each of the kids as you find them during the intro portion. You’re able to switch around characters depending on specific needs throughout the game, such as having to push boxes in order to create a path, or shooting light boxes in order to solve a puzzle. The concept works well since each of the kids has their own quirks when it comes to combat as well, like different health point amounts, attacks and even evading options. Speaking of combat, it feels a bit wonky due to how the controls are mapped to the controller. Evades handled by the right analog stick instead of an actual button, which gets in the way from actually moving your character with any amount of depth across the screen. That depth also threw me off during one of the many jumping sections in the game, resulting in a lot of reloading from the beginning until I got them just right. Even with the ability to adjust your movement in mid-air, there’s little time to do so before you miss — add to that some insta-fail things that can get in your way even while you’re in the air, like searchlights. I eventually chose to stick with the bigger kid who’s tougher and more resilient for combat, and using the protagonist, who’s the only one able to climb ladders and shimmy across vines as my platformer, switching with the jetpack kid to cross longer gaps. That group interchange got more demanding the further I got into Crossing Souls, but never to the point of it being annoying. The one thing that is a little weird me is that there’s no character development system at all in this game, especially taking into account the amount of side content to partake in, it’d be easy to expect some sort of experience point balancing or even upgrades to health points and such, but no, there’s nothing to be had, other than picking up hidden collectibles that net you a handful of achievements/trophies. It would’ve been cool to have some sort of buff up to the group because some of the boss encounters can get a little hairy. Coupled with the fiddly controls, having to dodge projectiles and find open spots in bullet-heavy attack patterns can prove to be pretty challenging. While the boss fights can be considered tough but doable, the intermingled minigames proved to be too much for some players. One in particular involving the DeLorean — no cute reference there, it’s THE time machine from Back to the Future III, complete with all the circuitry and lingo, as well as Einst… er… Copernicus — has you mashing buttons Track & Field style in order to boost Doc’s ride fast enough so it travels back in time had the developers patch its difficulty down due to public outcry. Even though I didn’t particularly have any problems relating to difficulty, it did bother me that there’s no way to skip any of the lengthy dialog bits or cutscenes during the game, which made retrying some sections quite annoying, especially towards the very end. The fact that checkpoints don’t occur regularly is troubling, even more so since you can only save your game at save point diskettes. 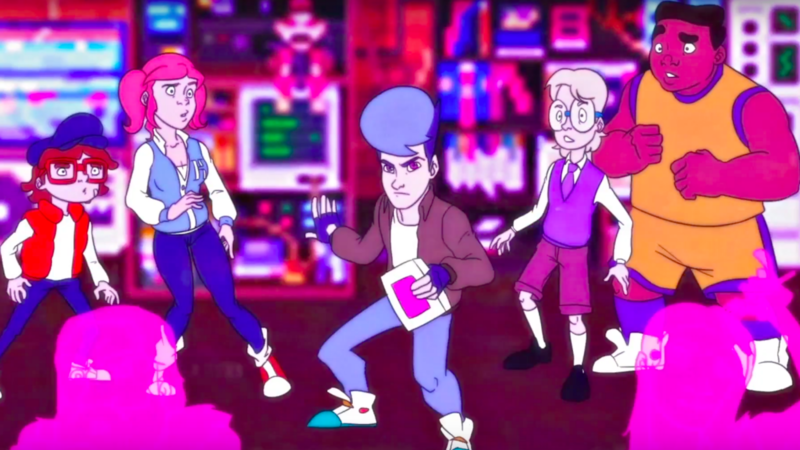 There’s an undeniable charm to Crossing Souls that comes from its presentation and reverence to that period in pop culture that clearly shows the developers’ passion for that decade. So much of the game hinges on that nostalgic bone, with pixelized He-Man, Teenage Mutant Ninja Turtles and the such dolls everywhere, posters with various popular franchises and even collectible video tapes from famous movies, comically edited out for obvious reasons. The amount of references might prove to be a little too much for some players, but considering Crossing Souls run time of around six hours, I didn’t find it overt, thanks to the zipping pace the game carries itself, lengthy (and did I mention unskippable?) cutscenes notwithstanding. Glaring issues aside, I had a good time playing this game.